The underwater photography with the high resolution and dynamic range of today’s digital cinema cameras allows amazing possibilities that until a few years ago were simply unthinkable. Nevertheless, underwater photography is an extremely difficult field of operation and needs great experience, knowledge of camera and lighting, not to mention scuba diving skills and profound concentration ability. Even the simplest and common operation on a standard set becomes a highly dangerous challenge when the shooting is underwater, both in open sea or in a closed underwater environment. Specially since the cinema cameras are digital and almost every piece of professional gear has some kind of electronic connection, the smallest leak of liquid can jeopardize the entire day of shooting. 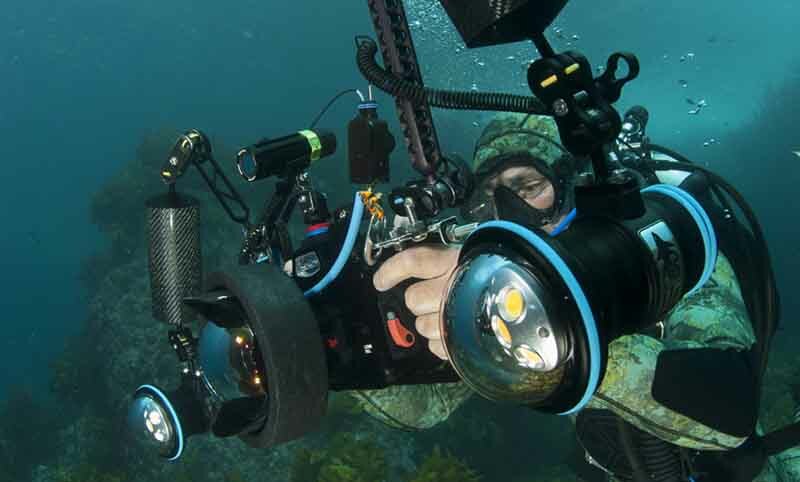 The change of a lens, the settings of remotes controls or the closing of the underwater cage require experience and time, so it is paramount that the crew is formed by highly skilled technicians that now exactly what to do, when to do it and how. At Camaleón Rental we can provide top notch underwater technicians for this type of shooting, because at Camaleón we do care about your project and we will make it possible, wherever you need to shoot it!